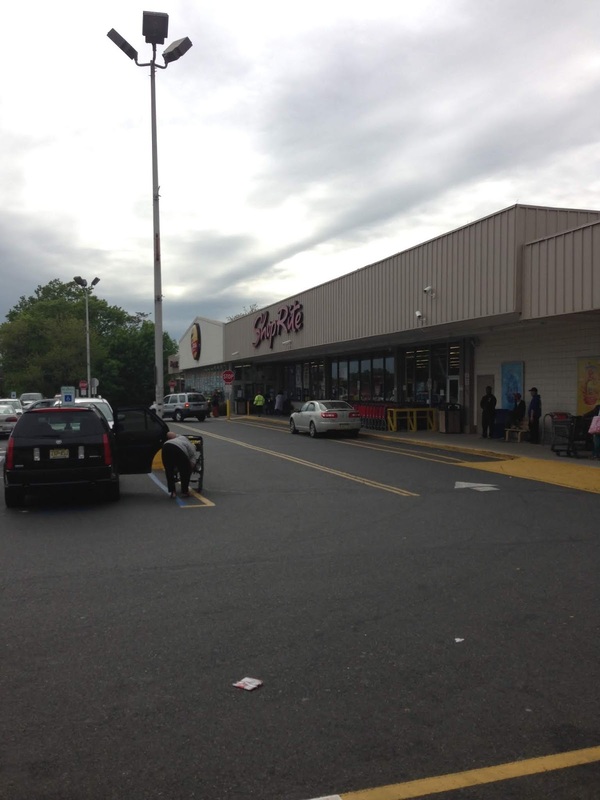 Let's check out a ShopRite today that, like Byram and Oakland, is quite large but made up of several expansions. However, the ShopRite here in Hillside is older than both of those two, if I'm not mistaken. The signage facing US-22 is kind of representative of the organization of the store. 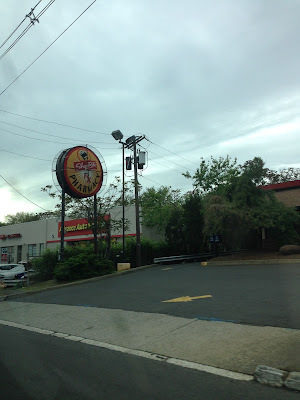 Way off to one side, there's a ShopRite sign near the driveway that directs cars into the store's parking lot. 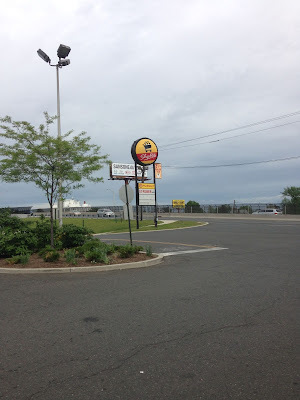 All the way at the far side of the property, even past the Burger King outparcel, is a randomly placed but huge ShopRite Pharmacy sign that, by the time you get to it, is way past any driveway into the store. Notice that 22 is a divided highway here, and this sign is nowhere near the store. This beauty was also located just west on 22 for eastbound traffic (you take the Bloy Street exit, then run along 22 on a service road and go under the highway on an underpass that also contains a pedestrian walkway, important for those in the neighborhood who don't drive). Unfortunately, it's gone now. You can see that the underpass to get to the ShopRite from 22 eastbound and downtown Hillside looks better now than it used to, also. It's still a bizarre property layout, and it doesn't get more logical inside the store. But first, check out these carts! I've seen these at other stores since, but I was at Hillside back in May 2016, so it was one of the earlier places to adopt these carts. It couldn't have happened soon enough. The store's fleet of the junkiest red plastic carts was replaced by these, which seem durable and are much more modern in design. 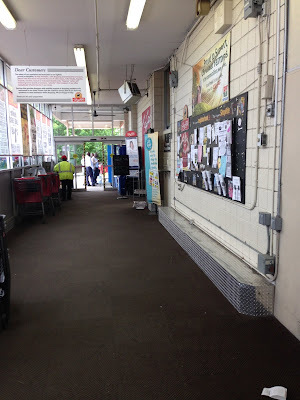 We head in to an alcove, and the entrance is on the far side of the store. To the left is a strange alcove that may have been something else originally, with produce in the first aisle and another awkward alcove at the back. Seafood, meat, and deli line the back wall. The store originally ended where deli is now, but in an expansion with a diagonal back wall, dairy lines the back and side wall with pharmacy on the front wall. Bakery is in the older part of the store on the front-end. Floral is on the front-end between entrance and exit, and customer service is actually in an island opposite the registers. You can really see the store's age in places, such as this foyer. It gets better inside. Starting off with this random junk alcove immediately inside the main entrance to the left, then on to produce. Apologies for the blurry pictures throughout. This was a few cell phones ago. Very nice produce department! The Smutko family owns this store only, and there are some homey and eclectic touches, such as the flashing neon Bananas sign (which was not on in this picture). The effect would be better if the boxes weren't blocking the decor. Although the ceiling is exposed, it's still pretty low. Looking back up towards the front of the store. The last renovation probably took place at the time of the expansion, which I'd guess was somewhere in the neighborhood of 10-15 years ago. 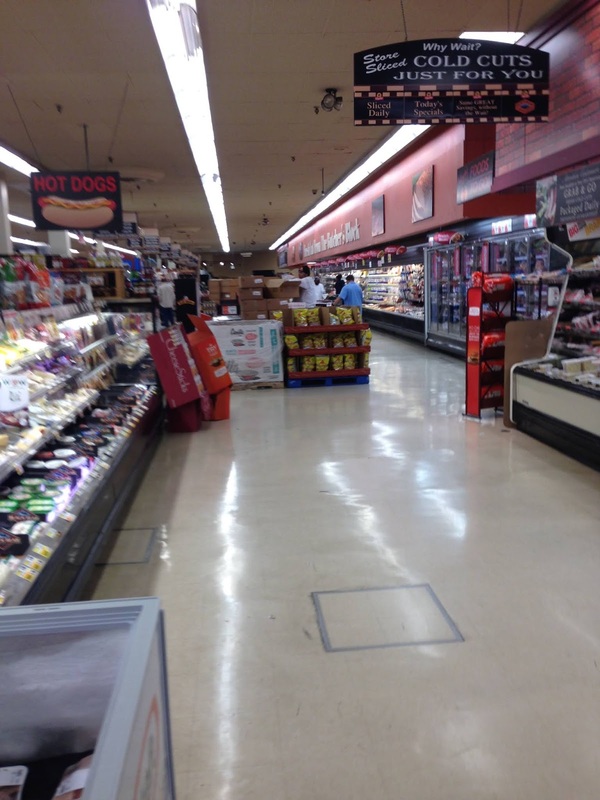 The back of the produce aisle is a small alcove with products like oils and condiments, with an L-shaped seafood counter next to it. 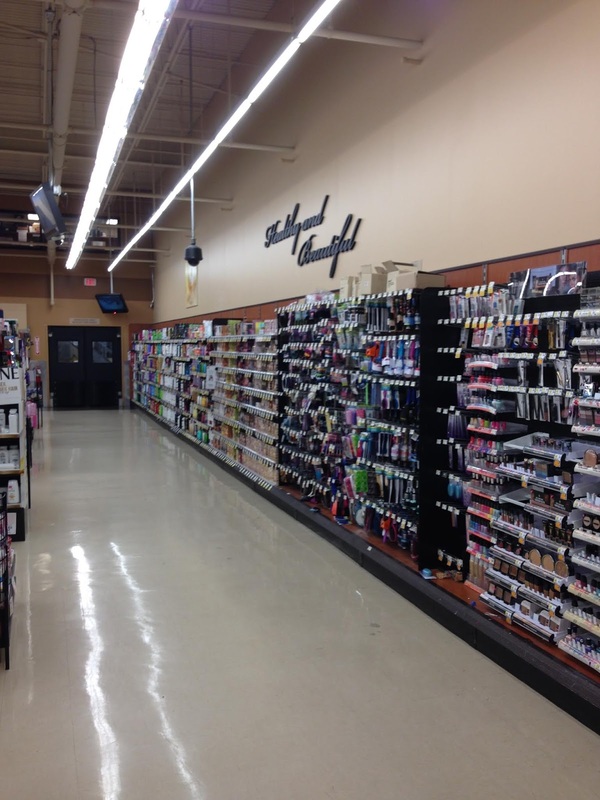 Notice that the aisle markers are actually mounted to the sides of the shelves here. The text on the wall straight ahead reads, "12-7-41 Never Forget 9-11-01" (the attacks on Pearl Harbor and the World Trade Center, respectively). The seafood selection is fairly substantial for a ShopRite, especially since it continues around the corner into the alcove. Meat and deli continue along the back wall. As you can see, the store gets quite crowded. But at a solid 65,000 square feet, it can handle the crowds. And with an astounding 12 loading docks on the back and side, it sure must be a high-volume store! Like Byram and Oakland, Hillside also has a fairly large selection of nonfood items. However, Hillside (being between Elizabeth and Newark, two of New Jersey's largest cities) is quite different as a town from either of the others! Well, I guess that sign avoids this problem. Because random junk like flannel shirts, toy trucks, and huge steaming pots are always useful, and always a great buy! Customer service is on the other side of this wall. Ah, t-shirts and flip flops. Supermarket staples. As we'll see, this isn't the end of the general merchandise here. Deli is in a very strange spot; one of the store's busiest departments is buried in the back corner of the store. Not only is it a strange flow choice, it becomes extremely cramped. Looking from deli back towards produce. 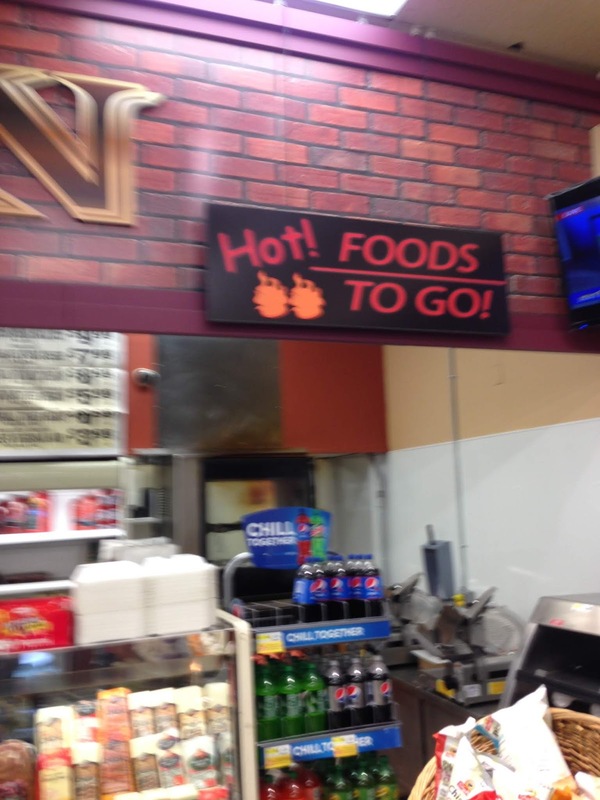 Ah yes, nothing like a Word Art-style supermarket department sign. Although the decor is not so new at this point, it's still looking in good condition, if a little outdated at times. And unfortunately for this sign, the Hillside ShopRite doesn't have a hot food department, just rotisserie and fried chicken. Also unfortunately for this sign, everything about it is awful, design-wise. Now we're heading into the expansion, looking back to the main store. The back wall of the expansion is diagonal, due to a train line that runs behind the store. You can see the pass-through door just to the left, and the back wall to the right. The rooms are actually on different levels, so hang onto your shopping cart! The expansion, which includes pharmacy, dairy and some random frozen foods, feels much more spacious and modern than the rest of the store. The ceiling is also higher. The pharmacy runs along the front wall of the expansion, with HABA products taking up a large amount of the floor space of the expansion. We're looking down the front wall in the above picture away from the entrance. This is really the only place in the store where we get to see the owner's name. Other members, such as Village Super Market, display it prominently. Ah yes, the wonderful discount aisle. 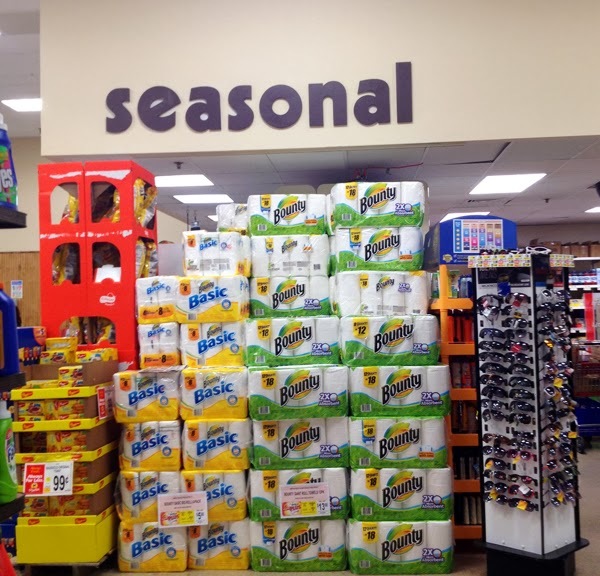 Clearly this ShopRite could take a tip from Universal Supermarket in Rahway on their display. Looking back towards the main store from the expansion. Pharmacy is just out of frame to the left here. Bakery is just on the other side of the wall we can see here to the right. Gotta love the lit ShopRite sign randomly placed next to the bakery counter! The front-end gets crowded quickly with long lines but the store is always busy. 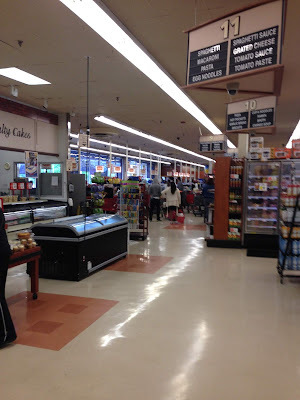 The Hillside ShopRite is definitely a solid supermarket with a nice selection, good prices, and high quality. But it's not exactly...how you say...polished. The exterior siding reminds me of the ShopRite of New Paltz, but with a different logo. And the round air diffusers inside look like something straight out of a Kmart. The vile Unarco PC41U carts that the all-plastic Bemis carts replaced appear to be a mix of 2nd-gen models manufactured between app. 2003-2013. The breaking point for the new Bemises would be well over 850 pounds for the full-sized carts and over 550 pounds for the express carts. True, and it's the same color scheme as New Paltz. Different owners, though. I don't really care what the new carts are as long as those old ones are gone! Thanks for the information.